Vice President Yemi Osinbajo on Tuesday launched door-to-door campaign for the reelection of President Muhammadu Buhari and himself in the forthcoming 2019 presidential election. Osinbajo, who took the campaign to Nyanya and Karu areas of the FCT, declared that President Buhari’s honesty, integrity and performance in the past three years in office as evidenced in the ability of the administration to do more even when the country is earning less, set him apart from all other contenders for the exalted office. 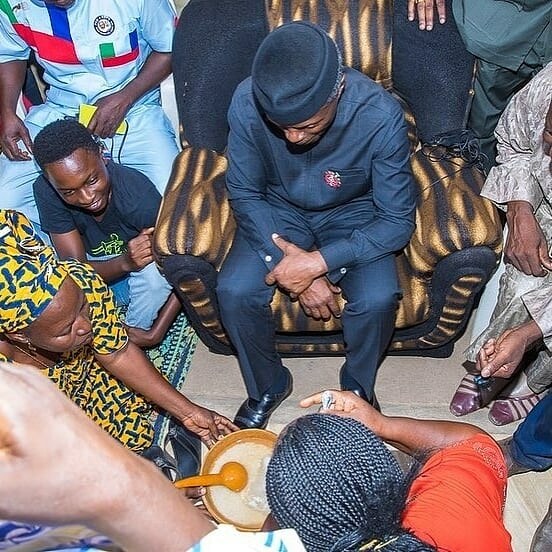 According to a statement by the Senior Special Assistant on Media and publicity, Laolu Akande, the Vice President visited two homes: Alhaji S.K Ahmed’s family in Nyanya and the Jimiko compound in Karu. After meeting both families, he said that Prof. Osinbajo addressed the mammoth crowd and spent time interacting with the excited people who thronged out in their numbers, often fascinated to see him unannounced in their neighborhoods. “We will go forward and we will move forward. It is a bit difficult now because we are building the foundation. When we came into office; We found no savings. Oil which was our biggest earnings, we had earned so much in four years but there was little to show for it. They didn’t build the railway, no roads. So, when we came we decided to first of all do the right thing,” he added.